Gain the Advantage with Investors and Stakeholders to Fund and Build Your Business. This updated, proven and trusted BizPlanBuilder® system produces a comprehensive strategic business plan for growth and/or compelling investor presentation to raise capital. Take your Business Plan and Strategic Planning to a new level! and formulated all of it into the new BizPlanBuilder — Making it the proven and trusted, “practical and tactical” business development roadmap and investor presentation system to build your company. Millions of entrepreneurs everywhere have some really great ideas. But, until now, they’re just ideas… The missing ingredient in most startups or growing businesses, which could otherwise become amazing companies, is a comprehensive execution plan. A plan that’s detailed, reliable and robust enough to help you scale your business into a solid company. convincing anyone to give you their money is going to require a comprehensive proposal. Here’s the proven and trusted system to win their hearts, minds, and money. You’ll be both more confident and persuasive to employees, investors, and partners when you can demonstrate your idea’s potential across multiple strategies, to validate your underlying assumptions, and strength of your concept. BizPlanBuilder also supplements the “business model canvas” and “lean start-up” concepts to give investors the details they want for funding your start-up or expansion. It’s the fastest and easiest way of turning your ideas into an investment-grade business plan and a successful company. In the aftermath of the “Theranos” and “Fyre Island” debacles, investors are far more wary. with all the ingredients to succeed, but that you are for real. “…Everyone knows that functionality is important, but all those pretty words and numbers won’t help you when you get up in front of a committee of investors asking how the numbers were derived. The distinction of BizPlanBuilder over other business plan software is the extensive step-by-step help, the wealth of documentation and business articles to help with strategy and business development, and the range of internal and online help and support. While other business plan software applications can help users create formatted and professional-looking plans on paper, what BizPlanBuilder does in addition, is help users create an understanding of their business to help sell themselves to investors and bankers. With its intuitive design and graphic controls, our new secure online dashboard makes business planning easier than ever by leveraging proven, done-for-you templates. Create an entire range of vital business development and funding documents. Why start from scratch? Let our experienced business financing and strategists do the heavy-lifting for you! Your part is easy. Simply click on any module to launch the document-builder wizard. Its organized system walks you step-by-step through the entire project. Review and edit the masterfully-scripted narrative and financial models to generate everything you need for your company’s strategic planning or investment funding. Update your document within the wizard, email it with a click, export it to Word or a PDF. Business Power Tools keeps all your business docs organized and secure — making it easy to find, collaborate, and continuously improve with your team, investors, and advisors. To get there from here, you must build a compelling case… based upon the market, your strategy, business model, the story you tell, the information you provide, the people on your team, the realistic promise in your projections, and your personal gravitas — your knowledgeable presence when pitching. Mistakes can be costly! But this is why business planning is crucial. And where the BizPlanBuilder system proves its highest value. Only 3-5% of startups get funded. Why? You might think of your business plan as an elaborate “brochure” that sells your concept to a variety of potential stakeholders. Investors are often considering multiple deals and they’ll ask a ton of questions. Whether or not they read your business plan cover to cover, the fact that you have the details when others do not, gives you a tremendous advantage and credibility. “I found it especially difficult to articulate my plan in a manner that would attract investors and the bank. I purchased BizPlanBuilder and developed my plan. There is a lot of detail in between, but, to get to the point… my plan, thanks to BizPlanBuilder, became a multi-million dollar company located in five states, and recently sold to a larger public company for more than $75,000,000. Learn about business, get new business ideas, all while designing your own company and preparing yourself for investors… At the same time, produce a compelling “brochure” to inspire your tribe into the future! If your business plan is sitting on a shelf, you’ve got the wrong kind of plan. BizPlanBuilder is great for a “mainstreet” business, but even better for fulfilling a grand vision. Many business planning products are sufficient for a simple business, but BizPlanBuilder is designed for bringing something new and huge into the world. Nothing can psych you up more than a clear vision for what you want to build as well as a clear roadmap to get there. Also, having a clear understanding of what you want the money for as well as a comprehensive and straight-forward presentation investors can believe does wonders for your confidence! Complete your MBA or win the school competition! Why did I create BizPlanBuilder? Way back, I remember reading in Popular Science that someone had invented a carburetor that got 200 miles per gallon. (Conspiracy theory? Urban legend?) Whatever happens to [real versions of] inventions like these?!? It’s always bothered me that many awesome innovations never made it to market. There are many reasons, but I’m sure a good business plan helps! BizPlanBuilder is the tool you want to build a thriving company around your version of a 200 mpg carburetor! Before an investor decides to dive into your 10 or 20-page document, s/he wants straight answers to a few basic questions about your business and your plan. They listen to what you say and your confidence behind your words. They want to believe, but they most trust those who’ve made money from them before, using BizPlanBuilder gives you that “way of being” they’re looking for. Having everything done right and all together keeps them focused and moving forward on your deal! We bring together an experienced group of entrepreneurs, advisors and investors who have shared their experience, knowledge and wisdom on what it takes to organize, fund, and grow a viable company in our current climate. Rather than you having to research, organize, answer questions in a vacuum or write from scratch, we’ve synthesized the best solutions from our many resources and provided them as examples for you to customize to fit your business. We’ve done most of the authoring for you. There are no blank pages, so there’s no writer’s block. Expert comments throughout explain issues and give clear, sensible advice in a step-by-step format. Big projects with huge promise — A real business plan makes a big difference! Saves time repeatedly explaining and promoting your business concept! Baby-Boomers — Retirement?!? Launch a business around your ideas! But first, carefully invest your retirement funds! ~ Ernie Neve, CPA, CVA, CTC, CVO of The Neve Group, LTD.
How much would you want to know about a business before investing in it? Or joining it as a career choice? Or partnering in a joint-venture? Or…? At best, others offer templates as a collection of empty “buckets” you must fill-in. We’ve already filled them in for you as a foundation for you to learn from and customize. That’s it? In this case… NOTHING?!? Do you know what to write in here? Do you know what investors and lenders are looking for? Sometimes you do get some useful ideas and content you can work with, but there’s often a good reason it’s free… It may be a “loss leader” to get you in the door to sell you more expensive services, or to build a list to sell you something else?! To properly address your project(s) at hand, we give you more. A lot more! Go ahead copy it. Use it. Make your plan better! If you were an investor, which plan would you trust? We’ve developed text templates and filled-in the blanks with exactly what to say and how to say it — complete text intended for you to actually use and customize to work perfectly for your unique business. Just edit the parts you need, add your ideas, and learn as you go. 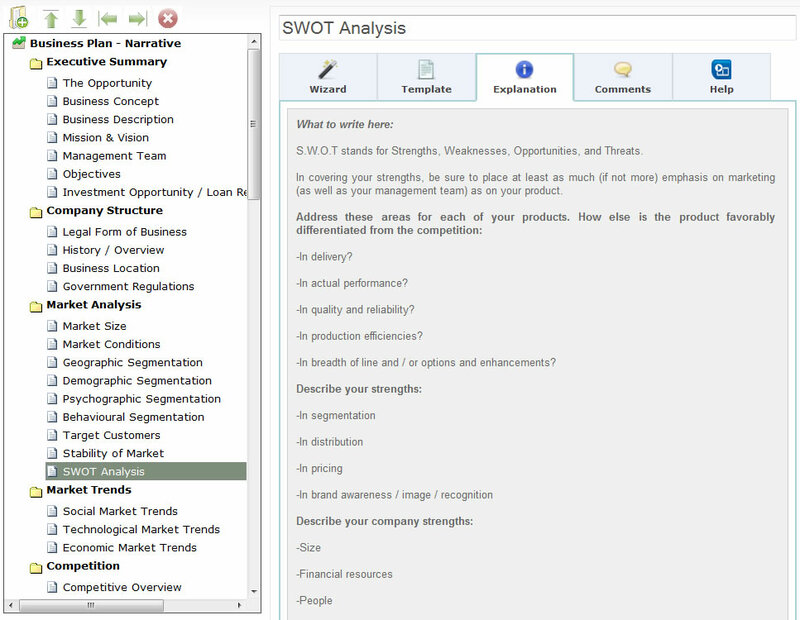 ⇐ When you click the example, you’ll see a our version of the “Management” section of your business plan. Go ahead and use it to create this crucial section of your business plan for free! We’ve done most of the heavy-lifting for you: the research, the narrative writing, the creating and verifying the financial models, proven the presentation decks… You’ll see when you subscribe. Access everything we have. Most of our testimonials are unsolicited. We’ve copied many of them directly from emails and texts to give you an idea of how real BizPlanBuilder is and how much others have accomplished using it. The questions and advice included with BizPlanBuilder are, in our opinion, the best part of the program. We recommend BizPlanBuilder because it gets you thinking about what it takes to start and run a successful business. And with a price tag of $150, it costs a lot less than a consultant. It may seem like more than you need right now, but you’ll quickly grow into it! Everything is easily customized for a perfect fit to your business model! Go ahead and try them both, use the one you like better! Add unlimited additional team & advisors to your subscription for just $1 / mo each! After you subscribe, you’ll land on the ‘Thank You’ page with a couple of informative videos. You’ll quickly get the gist of the system — and everything works the same way! “We love your software. It’s the best. Investors speak their minds about funding, business plans, raising capital… and what they’re looking for. Not only do you have to prepare to take on the entrenched special interests of the status quo, you also must prepare to take on the NEXT wave of disruptors coming up from behind. This is a different type of preparation, preparation for a pivot on top of a pivot. This is what will impress today’s jaded investors. Why BizPlanBuilder? Why now? Why you? Would you survive on the Shark Tank? Every one of the sharks on ABC’s The Shark Tank have asked this question. Have you ever heard them ask for a business model canvas? Are you ready for The Shark Tank?!? Go with the wrong business plan software because it was free, cheap or too-good-to-be-true and investors just know — and they’ll toss it in the trash. It’s worth it to do it right. What if you used the business plan system behind the success of more than 2 million entrepreneurs, 160 colleges & universities, 1,200+ consultants, and is responsible for funding countless businesses? It always looks unique and compelling, never cookie-cutter. “I made a deal with a large corporate partner for over a million dollars. It’s not a classroom-and-books education; it’s a nuts-and-bolts, street-smart education, a way of looking at business and funding that is true and that works. Show a Cap Table covering several rounds of funding + IPO or acquisition! Learn exactly what to include in your business plan and what to say from the first page to the last. There’s a sequence. You need to follow it. Darrin originally thought he needed money to buy airplanes, until he remembered that his goal was the airplanes themselves. Why buy airplanes when there are so many around? There are many ways to get what you need to build your business — it doesn’t always take lots of money. Look around… Who has what you need? And what kind of deal can you make to get it?!? How this BizPlanBuilder subscriber inspired a nice man to give him 2 LearJets… so he could start a jet charter business! Some time back, Darrin Perdue had three partners, with ten years combined flying experience, and a vision for a jet charter company. His plan was to first raise money and then buy a jet. The first investor laughed him out of his office. Then, while pursuing other investors, Darrin remembered that he knew a gentleman who owned two LearJets. Darrin used his business plan to convince the jet owner to let Darrin’s company (GoodJets, Hayward, CA) manage his planes. The company took off! While he didn’t have the money to buy jets, Darrin used BizPlanBuilder to map out his goals, costs, his team, his target market, and how he planned to scale the business. If you had 2 LearJets, what would you want to know? Darrin had a detailed plan. Today, Darrin’s company has 12+ pilots, with access to 50+ airplanes(!) and is on call 24 hours a day – providing jet charter services to executives, celebrities and medical transplant teams throughout the world. Investors will ask a lot of hard questions. Will you have the answers? A “Business Model Canvas” and a “pitch deck” may get you in for a first meeting, but it’s doubtful that will get you funding. A business plan is crucial — What you do, how you do it, and how you make money are at the top of investors’ questions. The process of planning is as important as the plan itself. As a smart entrepreneur, you must must consider every angle. Using BizPlanBuilder you’ll have an adaptive, coordinated, proactive and responsive strategy for funding and/or growth. Why use some cookie-cutter business plan for your unique kind of business? A competitor offers a web-based business plan as well as 500 sample plans — actually based upon a bicycle store or a coffee shop(?!?) That may be OK for a very simple business, but if your project is even slightly more ambitious and you want capital from “smart money,” then BizPlanBuilder is the business planning system designed for you. Another competitor promises you can write a business plan in just 8 hours(?!?) That’s great marketing hype and very attractive, but designing a respectable business — even with the best business planning software on Earth — will require more time than that before you commit your own money, the next few years of your life, and your credibility with family, friends, and investors. If your business is unique, you’ll benefit from our industry cross-pollination approach that gives you more to work with. We’ve incorporated input from thousands of customers and studied thousands of business plans, investors, lenders, deals and other business planning software over the past 30 years — and combined the best content and functionality into the BizPlanBuilder business planning system. Like most people who have compared, we think you’ll find that our content is actually more useful. I’ve used a similar template from the SBA, but theirs gives the user about the same level of instructional detail as assembling Ikea Furniture – vague and unhelpful haha. BizPlanBuilder is very straight-forward and easy to use! We’ve used it many times ourselves! Make it seem so real that they have no choice but to approve support for your project. 1) Do they show real success stories or testimonials for businesses or projects similar to or as big as yours? 3) Is it a system of inquisition, where they ask you hundreds of questions and the black box writes it for you… Or can you preview professionally scripted sentences in context with your plan that you can simply edit or fill-in the variables? 4) Is the actual text content designed to be used for real or is it just a placeholder that you have to rewrite anyway? Or are they just giving you blank pages expecting you’ll know what to write? 7) Do they include a comprehensive and proven PowerPoint presentation template, enabling you to easily develop your “pitch” to investors? 8) Does the same financing plan lend itself to executing your priorities, as well as serving as an ongoing operating plan? Is it easy to keep updating? Can you use it to manage the growth of your company.?? Whether you’re writing a formal business plan for investors or developing a meaningful forecast for your business, BizPlanBuilder incorporates a full set of business financial models. They are completely configured, fully integrated and tastefully formatted. There’s no need to be a spreadsheet or financial expert. We created “Assumptions” pages to make it easy for you to enter, update and experiment with your business model. All formulas have been developed and independently tested by qualified and practicing business consultants who hold valid CPA certifications. Enter your sales, expense, growth and other assumptions, and let BizPlanBuilder do the calculations. Show how believable numbers can add up — unlike other financial models (Input ⇒ BLACK BOX ⇒ Output), here you’ll see the math, and be able to understand and explain “how you got there” in a clear and logical manner. BizPlanBuilder automatically calculates totals, percentages and ratios to show at a glance how much money you’ll need, when you’ll need it, and how soon you’ll make a profit. It’s easy to update too — If you change a number, the worksheets automatically recalculate for you. 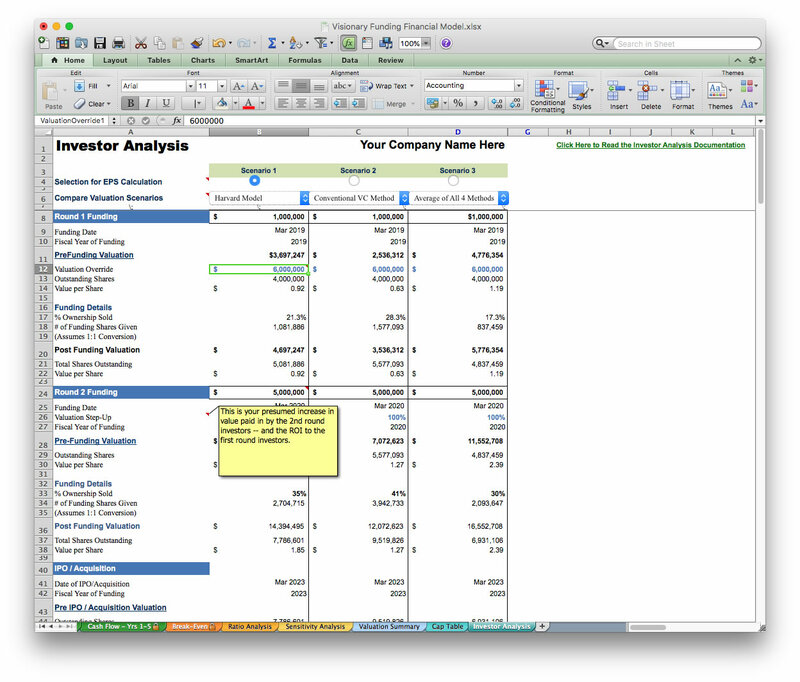 Now you can easily produce investment-grade financial statements ready for angels, venture capitalists and any bank. Project sales by product/line/marketing channel – including seasonal & mix adjustment. Worksheets calculate figures & create impressive tables to support your plan. Investor “deal” analysis – How much will investors make; How much will you make? It steps you through the development of an ideal presentation that appeals exactly to what investors are thinking — and looking for. Nail the biggest financing opportunity of your life! They’ll ask questions during your pitch! If you’ve done your planning, market research, and math… you’ll have the answers. If not, even a knowing response like, “We’re considering that now and are researching…” will suffice, but a blank stare and you’re in trouble! But not when you’ve developed your business plan using BizPlanBuilder! This is your BIG opportunity to fund your dreams! If there is a short-cut, BizPlanBuilder is your best bet! “I first learned of BizPlanBuilder capabilities while attending business school in San Francisco, CA over 12 years ago. Since then, I have used this software to develop and update my business plans for businesses I started and ran, and successfully secured $500,000 in funding twice during this time. Funders appreciated the level of detail in the write up of the plan, plus the correctness and detail of the financial pro-forma presented to them – it provided them with a tangible proof of my entrepreneurial capacity and success potential. They supported this belief by funding me. That is what happens when you wisely utilize the right tool to get the job done. These plans were created easily using BizPlanBuilder. All of these plans were created in a matter of a few days! What a huge time saver! Today, I am a successful business consultant. I recommend the BizPlanBuilder business plan software to my clients in need to develop and update their business road map! The next best thing to having us do the work for you is to have an expert sitting next to you as you write your business plan. Throughout every section, we’ve inserted expert advice, comments, and suggestions to explain what to do and why, and help you side-step mistakes. We include lists, links, samples, ideas, anecdotes and lessons others have paid for dearly. The financial models in BizPlanBuilder also include roll-over help on all key number-entry cells so you’ll know what to do. Here’s what investors & lenders are looking for! At the beginning of each section, Burke Franklin will introduce you to what is wanted and needed by investors and lenders. What do you need to think about as you edit and complete this section of your business plan? What are they looking to learn here? What are they looking for that may affect your deal? It’s a bit like a movie director giving the actor instructions for playing a scene. It keeps the project interesting and assures that you’re prepared for any audience. Collaborate on your business plan and financial model with friends, business consultants, partners and even investors! Besides your ability to edit every section and customize it completely (you can also click to access the HTML), you have a comment page attached to every section of your plan where you can keep non-printing notes. Management Teams — Share the work and get your plan done better and faster, with full buy-in from everyone! Section by section Check-Out & Check-In prevents overwriting each others work! Ugh! What better way to gather input and inspire action? Sure, you can tell everyone one exactly what you want them to do, but if you want a high-performance team, you need to include your team and advisors to paint the whole picture together. Now it’s easy enough to share the work and gather their ideas and solutions they can buy into and follow. It’s like a brochure for your business — Print copies and give them to everyone who can help you! Your team also must be on the same page to answer investors’ questions during your pitch! People tend to support projects they have a hand in creating. Your people can take the right actions in support of your big ideas because they have your movie script and they helped write it! BizPlanBuilder also makes it easy to pivot or engineer changes in your company and engage everyone’s support. Wise forethought can remove obstacles before they appear. Beyond the “business model canvas” and “lean start-up,” BizPlanBuilder provides the structure to choreograph your story. Show investors and others the promise of your business, its positive impact on the world, and your roadmap to success — everything to inspire investment and support. What if you could finance your company without money? Over the years, we’ve learned that what impresses investors most is how much you can accomplish with what little you have. Prove that you’re resourceful and investors are often inclined to bet on you. Better yet, you may be in the enviable position of not needing their money! $65,000 loan to buy store from owner! What do you show them? What do you leave behind for them to read? When you ask family and friends for money, the first hurdle you may need to overcome their perception of the “old You.” Your new business plan must demonstrate to your friends and relatives the current you and prove that you can be responsible with their cash. And that your past was full of rich learning experiences from which you will now earn yourself and them a fortune! BizPlanBuilder will step you through it an do the work for you. As you are likely already aware, crowdfunding is an online, grassroots way to raise money through the generosity of your family, friends, social network and strangers. Crowdfunding enables you to raise a lot of money from a lot of people. Crowdfunding is hot right now and will only grow – what with the new rules from the SEC. Crowdfunders also want to understand why your business, why you, why now, and what will they get for funding you. What’s your plan for the money? Like sophisticated investors, crowdfunders appreciate a good deal, but they still demand the same details. Remember, you’re competing with other deals on crowdfunding sites, so you need a stand-out plan that answers investors’ questions and makes the best case for investing their capital with you. Many equity crowdfunding sites even seem to offer a business plan, but they really just offer a bunch of empty “buckets” to fill in from yours. Not to worry. Simply copy and paste, or upload either your entire plan or just the required sections created with BizPlanBuilder. 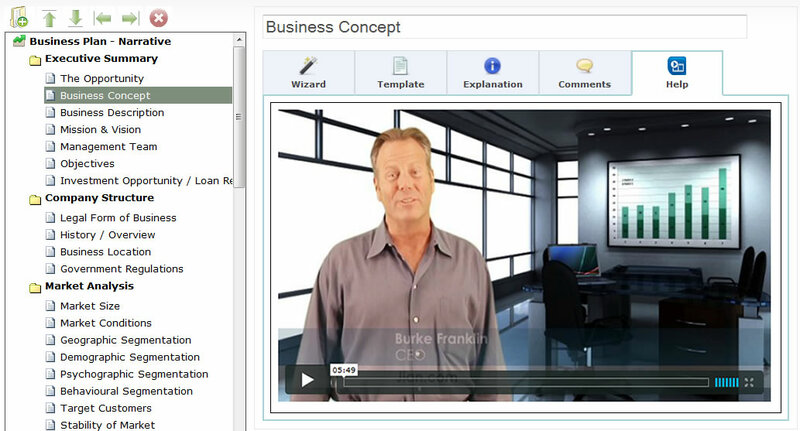 “BizPlanBuilder is the best business plan software on the market. We have used other packages, and when we found BizPlanBuilder, we decided it is the one we want our clients to use. In our business, we do a lot of SBA loans, all across the country. It’s important for the bankers to see the personality of the business and the people involved in the ventures we are seeking funding for. Financials alone are not enough. All the aspects of a business need to be covered in the business plan, if a company is going to be considered for funding. Angels and Venture Capitalists are tough and can be brutal on business plans. We’ve been listening, watching, and working with investors ourselves for a long time and we’ve built-in the answers leading you all the way with the text and numbers in the structure they’re looking for. A computer can generate your plan, but before anyone signs a check they’ll want to talk to YOU. With BizPlanBuilder, you’ll be prepared with the 2-3 page summary, as well as the complete plan, a proper presentation, and the answers to the tough questions most investors and lenders will ask! The real reason BizPlanBuilder has been so successful for so many CEOs is that it covers all the bases to convince yourself that your business / concept is worth investing in. Now, when you pitch it to investors and others they’ll believe you! Tip #3 – You can’t promise a sure thing, but you can be a good bet. The better business plan you write, the better deals you’ll make! Consider every aspect of your business — think it thru with help from others… Do whatever it takes to fully believe in your business, yourself and your offer. Tip #4 – Investors often go to the financials first. Tip #5 – You’re giving investors your 10-20 minute presentation — they’ll interrupt with questions (that’s actually a good sign proving their interest), are you ready with answers? Tip #6 – Investor Demographic: Middle-aged men, highly educated. Yours may be different, tweak to connect accordingly. TIP #7 – To reach the tipping point where an investor will write you a check, you must illustrate an operating and profitable business — then show them how their investment will return 10X. Sometimes investors want too much — they want more because they must compensate for the risk of potential failure… That’s why you must think thru your entire concept, anticipate issues and explain how you will succeed anyway. TIP #8 – Strategic Sequencing. One of the biggest mistakes we see start-up companies make is doing things out of order. Spending money on something now that you don’t need until later can not only set back your whole project, but could leave you flat broke. Create a plan and stick to it. With the business opportunity of a lifetime in front of you, it’s crucial that you are understood and taken seriously! Are you a professional business advisor? Our customers need all the help they can get and that’s where you come in. We’re creating partnerships with consultants giving you more to offer your clients as well as a better way of managing projects with them. If you are such an advisor / consultant / expert, we have a number of profitable growth options for you. Thinking about using our apps, templates, and dashboard to supercharge your consulting practice? Even experienced business planners report how useful BizPlanBuilder is even as a checklist to remind them of everything to consider before presenting to investors or lenders. Why we love business consultants! At first, it may seem that our software competes with business consultants, attorneys and other business advisors. However, when they started using our software templates themselves they realize just how much time and client education effort they saved. If you’re looking for a loan or line of credit over $100,000 or SBA backed financing, you’ll need a business plan. Bankers hate risk. They also know that businesses with a plan are more likely to succeed. Aaron Parnell landed a $700,000 SBA Loan for his wellness center! You cannot BS your way through these projects! Do so at your peril! They’re being read by real people with a real interest in your business, not a teacher’s assistant in a hurry to meet friends for a beer! It takes a lot to build a successful business. BizPlanBuilder makes it easy to implement your key foundation building-blocks because we’ve already done the heavy-lifting: the content, financial models and worksheet calculators, the presentation decks… What better way to teach budding entrepreneurs? Thinking about using our apps, templates, and dashboard to supercharge your business classes? BizPlanBuilder has been widely adopted by business schools and has been used by thousands of MBA students to produce their business plans and enter competitions. While we market BizPlanBuilder as easy to use and practically done for you, there’s plenty of rigor for students for learning and doing. Not-for-Profit? Give donors what they need to inspire giving! BizPlanBuilder is the software template to help you write a grant proposal to raise the funds you need. You may be thinking… business planning is not for nonprofits, but this has every element of the strategic plan you’ve been looking for. Financial projections and marketing plans are equal to grant budgets and outreach plans. After using these simple tools, you will have a clear action plan to share with donors. Once you know your strategies for the next 6 months or 6 years, donors will be compelled to give you the funding you need. Grant money comes much more easily with a clear and compelling business plan demonstrating service & sustainability. Although your motivation may not be for money, you must still operate your organization like a business. BizPlanBuilder has proven successful for appealing to grant funders because it enables grant seekers to provide such a credible proposal. Inspire donors to choose you! With so many opportunities to give, donors and other funders are becoming more discerning. They want to be sure that your organization is as sustainable as possible. Even big companies use BizPlanBuilder because they want good ideas to get past the politics and be implemented profitably. BizPlanBuilder works for any industry or type of business. Launch a new division or secure a bigger budget! If you haven’t taken the plunge to go on your own, consider having your company back your ideas. Management wants to know what resources you’ll need. How long before payback? What’s the risk? BizPlanBuilder helps you justify your program and gain your management’s buy-in. You can even design your plan to earn a % of your success. Better! – Ask anyone who has compared! Everything you need to plan, develop and produce a comprehensive business strategic and/or funding plan, financial model, and investor presentation for your company is right here! Get started now — You’ve got a 2-month headstart! We’re here to support your success in every way possible. What’s most important is to get your project done. And done right. We’re so sure that our business planning and management software templates will help you succeed, we offer an extended 60-day get-started period to assure your satisfaction. Test-drive any software app, template, or subscription for 60 days, and if you aren’t blown away with the depth and breadth, just give us a call or send us an email and we’ll credit your account so fast it’ll make your head spin! Your investors and stakeholders thank you for choosing BizPlanBuilder! I’ve used BizPlanBuilder myself to raise capital from my parents, friends, family members, a $225,000 SBA loan, $750,000 line of credit from Citibank, and other investments from angels and institutional investors — every time we learned something and built that knowledge into the BizPlanBuilder system!